White Wolf : Elderly wolf dog gets a belly rub and asks for more. 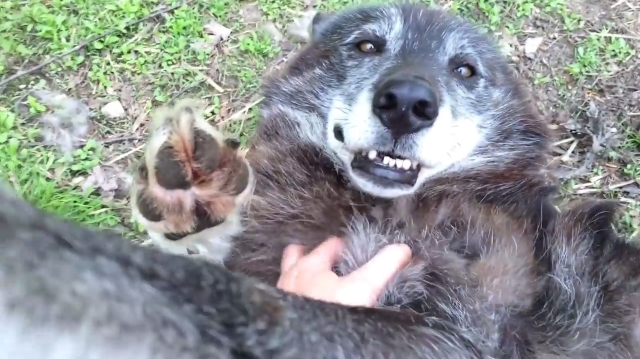 Elderly wolf dog gets a belly rub and asks for more. Lakomi, a wolfdog that lives in an animal sanctuary according to YouTube user Sarah and the Wolves, is clearly a fan of belly rubs. While she was found living in the wild at eight months old, it was clear to her handlers that she was bred in captivity. She's now living happy and healthy in the sanctuary, but just imagine how majestic she would be prowling the northern lands of Westeros. Video owner says "She was found surviving in the wild at 8 months old, however it quickly became apparent that she had been bred and partially raised in captivity. At the time of her rescue she was wearing a harness intended for an 8 week old. Her skin had grown over the harness and removing it took hours of surgery and months of medication to fight an infection that nearly took her life." "She took about two months of daily exposure before she would allow physical contact, but once that wall came down she quickly became playful, sweet, loving, and the rescuer's personal favorite animal in my charge. Lakomi is a gorgeous example of the redemptive power of love, and being able to know her is one of the greatest privileges of my life." said Sarah. Responses to "Elderly wolf dog gets a belly rub and asks for more." She's a very good girl. I love her.